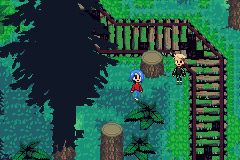 This is the game I currently working on. 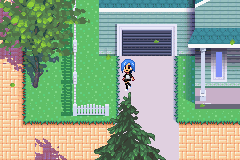 Making it for Gameboy Advance. It will be story-based quest style adventure. 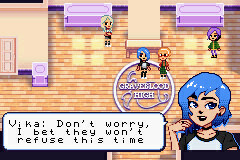 Vika and her family just moved to a small silent town Graveblood. Here she meets with the guys who tells her about a legendary enchanted book - as told by this legend, the one who will take it, will be cursed, but this book gives a big magical power to it's new owner. They all then get to the abandoned library, where this book is placed and the moment they open the doors, an evil spirit is released and hit the town, so our quest now is to defeat the evil spirit by any means. WOW! It looks really professional. Great work, now I'm dying to try it. My GBA/DS library to render strings of any size anywhere on screen. If you're using devkit arm you cab just take the sources and use them directly, you only need to get a handle of the font interface. Maybe I should update github to include a sample. Now this is gangsta! I love it! 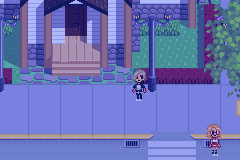 So the development is not too quick at this point, but here is what I have added so far. 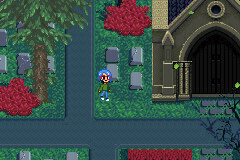 In Graveblood you will be able to buy a skateboard and use it to travel faster. Not only that, there will be an option to choose deck and wheel colors, and even buy different models. 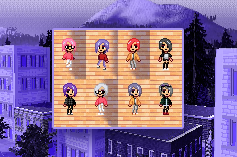 Speaking of customization, Vika can buy different clothes and hair dyes, but they also can be obtainable as presents by friends. So make more friends or save your in-game lunch money if you want to get this special look you've dreamed about. A little update. 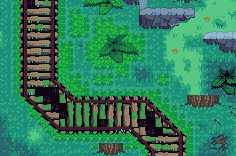 Redrew the rocks, added animated river, made the railroad rounded. The forest never looked so sweet before! Second screenshot - how it used to look before. Working on blending modes to make dynamic weather and day cycle. Just made a simple blending into color. Working with a 15-bit colors, 5 bytes for each channel, meaning I have 32 intensities for red, green and blue channels. What I do is simply looking for color in each palette cell, when apply mathematical operations on the color and send the result value back to the cell. 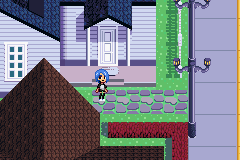 On this screenshot I find average value between each color and blue, this can be used for making an overcast weather effect. I also want to add some blending modes so I can adjust picture contrast, vibrance etc. on the go and to apply different cool filters. Cool stuff. I dig the art style. A new beautiful location - school and surrounding areas! Deaf Town? I am sorry, but it sound like rude thing about deaf people. It mean there are deaf people in town or silent town? To me, it does like rude because I know it mean. It can be mean as mute and silent. Deaf town is not right word to describe. Silent town should be right word to describe. And oh, I will should be worrying if I were you because there are some deaf people are member in this site. And I am one of them. Some people around know me that I am deaf and they know they have sensitive. Deaf town seem not right to use. You saw how I react to respond the word this person use "deaf town". Which is I do not know what he ref to. Is there deaf people in town or it just describe for silent? So I rather silent town instead deaf town. Everything I'm seeing here is top-notch. Can't wait to see where it goes from here! If you do not know with certainty that there is any ill intent here, you should never make such serious accusations. Firstly -- there are many, many other definitions for the word other than merely a person unable to or has difficulty hearing. Second, unless you see actual discrimination against deaf people here, it shouldn't be assumed that they're being cruel or insensitive in any way. Much like there is for the word "mute", many people have serious physical and psychological reasons for not being able to speak. I have close members in my family who are both deaf and mute. However when every F-Zero game and/or romhack is made with its multiple "Mute City" tracks, there isn't a demand to change the name because it's understood that it isn't an attack on people who are mute -- nor would I assume Nintendo is in any way being discriminatory toward my family. The same goes for this lovely project. When it comes to interpreting something like rudeness, the burden it's also upon you not to misinterpret intent. Making demands to change something based on misreading intent is rude on your part. Why suggest that people need to tiptoe around the word, as if being deaf is some horrible thing that has to be hidden from people? I think THAT is more insulting, to say that their condition as so horrible that people need to treat it like a taboo word that must be hidden from sight. If someone's deaf, so what? That's their own business. They live with it every day. Just seeing the word in a game shouldn't cause them to break down in tears. If it does, they've got bigger issues than just being deaf. Hell, there are people who are PROUDLY deaf, oppose cochlear implants and swear by sign language. More power to them! Well, English is not my native language, sorry for mesleading description. Deaf is just a direct translation of how we call small and silent cities here in Russia figuratively speaking. Anyway thank you for pointing out my mistake, I am trying to learn more and there's definitely a room to improve. And just to point out, I don't find using the word deaf any insulting in the case. Don't worry about text quality in game tho. Even though most people says my English is quiet good (despite such stupid mistakes, lol), I am still going to hire a professional to make dialogues as good as it possible.